The Skolkovo Foundation signed a raft of agreements with both Russian and international companies and venture funds at the Open Innovations forum this week. Skolkovo's chairman of the board Igor Drozdov (left) and Russian Post's Nikolai Podguzov. Photo: Sk.ru. Under an agreement signed with Russian Post, the federal postal system, Postal Technologies will open its own premises inside the innovation city. Postal Technologies is focused on developing technologies to digitalise the business processes of Russian Post, and is also responsible for cooperating with startups working in related areas. Nikolai Podguzov, director general of Russian Post, described his company as a “powerful transport and logistics IT company," and said its office at Skolkovo would focus on areas including artificial intelligence, robotics and automating logistics. 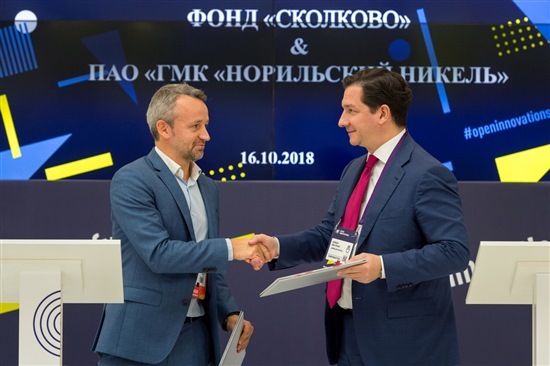 “Obtaining the status of a key partner of the Skolkovo Foundation is an important step that underlines Russian Post’s striving for continuous modernization and to increase efficiency by introducing advanced tech solutions,” said Podguzov. He said the company would not only develop its own solutions at Skolkovo, but would also test other available technology and work closely with startups. Skolkovo's Vasily Belov (left) shakes hands on the deal with Rustam Temirgaliev, head of RCIF. Photo: Sk.ru. Skolkovo also signed an agreement with the Chinese telecoms behemoth Huawei on setting up a joint innovations centre. The centre will focus on areas including developing algorithms for 5G wireless systems and the Internet of Things, and on using artificial intelligence to process media including images, sound and video. The Skolkovo Institute of Science and Technology (Skoltech) will also set up a joint laboratory with Huawei under the agreement, focusing on artificial intelligence and machine learning, the Internet of Things, and quantum computing, among other things. In another sign of Chinese-Russian cooperation, the Russia-China Investment Fund (RCIF) pledged to invest 1.5 billion rubles ($23 million) in the three funds of Skolkovo Ventures, the foundation’s investment platform, and will also be the anchor investor in two new Skolkovo Ventures funds, putting a total of 300 million rubles into them. Skolkovo Ventures currently comprises three funds, devoted respectively to digital, industrial and agricultural technologies. The partners plan to create two new investment funds by the end of 2019 devoted to “special situations” and “hi-tech vertically integrated companies.” The strategic partnership is aimed at creating new business opportunities for both Russian and Chinese hi-tech companies. ‘Attracting international investors and providing access for Russian venture companies is a planned stage of the development of Skolkovo Ventures and of the overall ecosystem of the Skolkovo innovation centre,” Vasily Belov, CEO of Skolkovo Ventures, told Sk.ru. Skolkovo's Alexei Belyakov (left) and Nornickel's financial director Sergei Malyshev. Photo: Sk.ru. It was also agreed at the Open Innovations forum that Russian nickel producer Nornickel’s digital laboratory would move to Skolkovo. The laboratory has been operational for less than a year, but has already launched production of several products after assessing new technologies and creating prototypes of digital solutions for the company’s needs. Nornickel plans to invest 350 million rubles over three years in its digital laboratory. 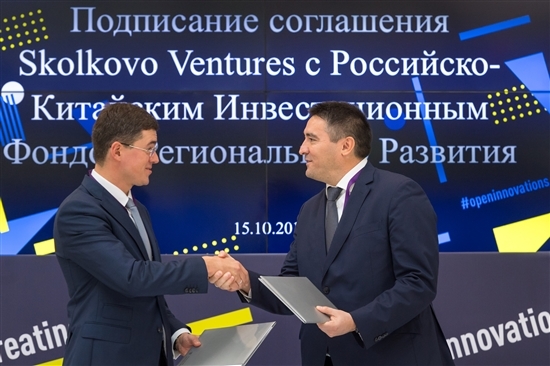 The Skolkovo Foundation will put its research infrastructure at the services of the nickel producer, and will also provide access to the inventions of Skolkovo resident companies. 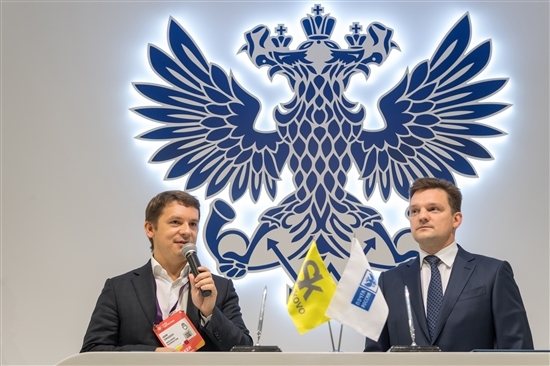 The digital lab will focus on industrial robotics, additive technology, industrial internet and engineering software, said Alexei Belyakov, head of Skolkovo’s advanced manufacturing, nuclear and space technologies cluster. Skolkovo also agreed at the forum to launch an educational initiative in partnership with German pharma heavyweight Bayer and the state patenting agency Rospatent on helping innovative biotech projects to protect their intellectual property. The initiative will take the form of a competition, Patents Power, which will conclude in a final during the Patent School at Skolkovo on November 1-2. On the final day of the forum, Skolkovo signed an agreement with GLONASS, Russia’s satellite navigation system, on monitoring vehicle traffic on the roads of the Skolkovo innovation city. “We hope to demonstrate the economic effectiveness of new technologies in the field of smart transport systems,” said GLONASS president Alexander Gurko. The two sides will set up a monitoring system aimed at increasing safety on the roads, reducing traffic jams and managing passenger flows to reduce the time people spend on their journey.